Arriving at the St Regis, Saadiyat Island, Abu Dhabi was special. Only in Hawaii have I encountered a beach so white and clean with water so delightfully turquoise blue. David Gandy and fans Dolce and Gabbana would gasp at the sight of it. This decadent golden hotel is secluded in a private villas-style gated community and the multiple pools one can see before the Arabian Sea. 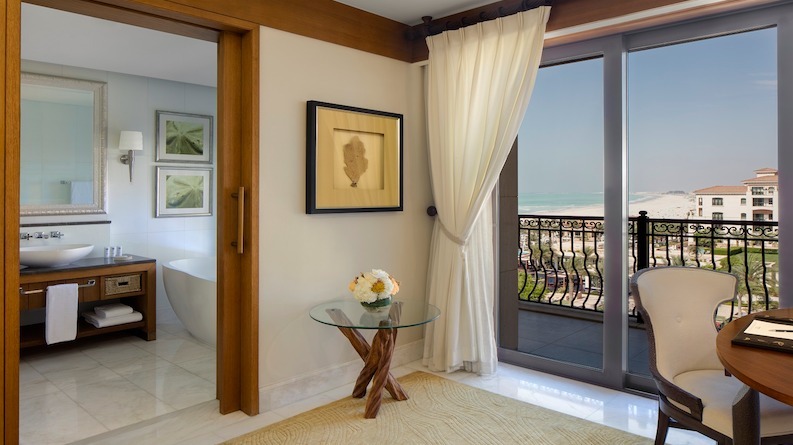 The hotel with its gorgeous Mediterranean inspired façade, dotted with palm trees lead to stunning views of the Gulf and a seemingly infinite horizon greeted us as we made our way up to our premium superior sea view room. What most warmed me was the welcoming Arabian hospitality the Emirates are well renowned for. Our room was charmingly furnished in a relatively simple manner. Out with the expected opulence, St. Regis felt traditional and reserved, classy and understated if you will. Delightful Arabian trinkets are scattered around the room and Bedouin finery and weavings adorned the walls while the picture-perfect view across the sea felt like a window into the exciting prospects which lay ahead during our stay. All this luxury was making me peckish. 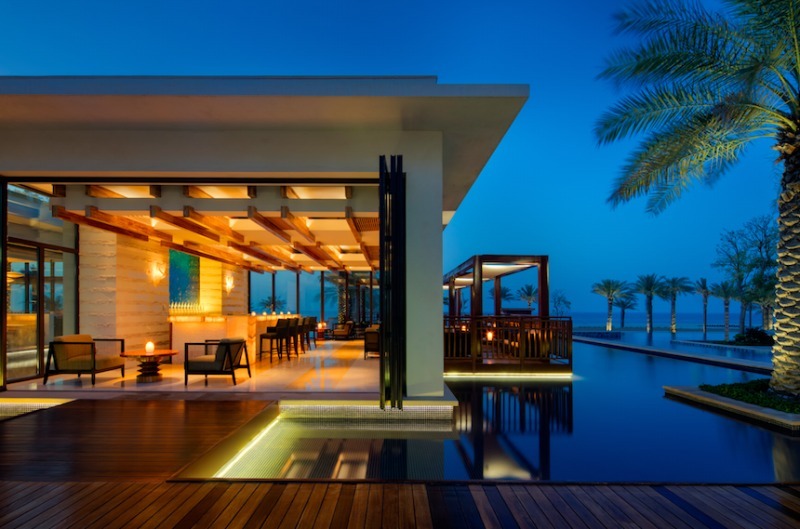 St Regis Hotel Resort thankfully is a foodie’s dream. 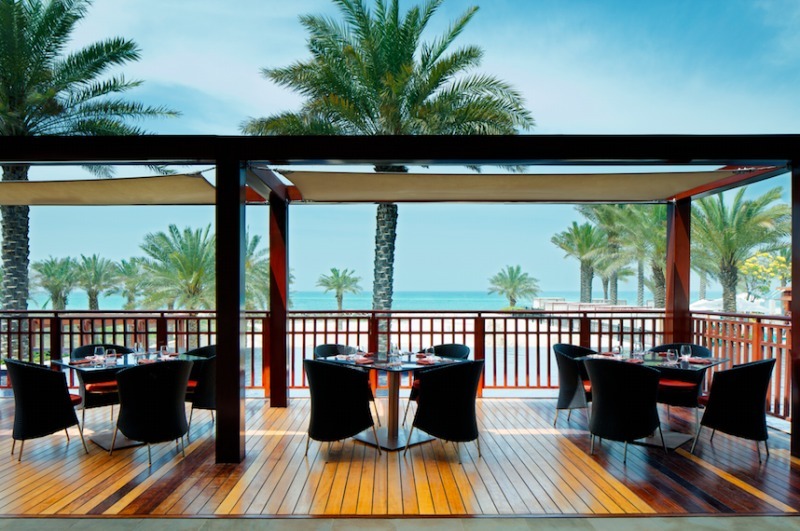 With the hotel’s bountiful array of restaurants there is something for everyone’s tastes. The 55th & 5th The Grill, serves Premium Wagyu Beef and fresh oysters. What more would you want or expect in the world’s capital of pearls?! Or, if the Mediterranean architecture has made you crave for Italian, Sundays between 1830 and 2300 is the night to frequent the Olea Restaurant for Delizioso – The Italian night. It’s a delightful cool and airy marble clad dining room, the perfect escape from the Arabian heat. The Manhattan Lounge offers a wide and varied collection of refreshing cocktails and beverages and to wind down and relax to the sound of the waves arriving on the beach with a classic vodka martini. Personally, I heartily recommend opting for the signature cocktail, The Arabian Snapper, or I would describe it as an intensely revitalising Bloody Mary with a Middle Eastern twist – this certainly pricked my ears up! 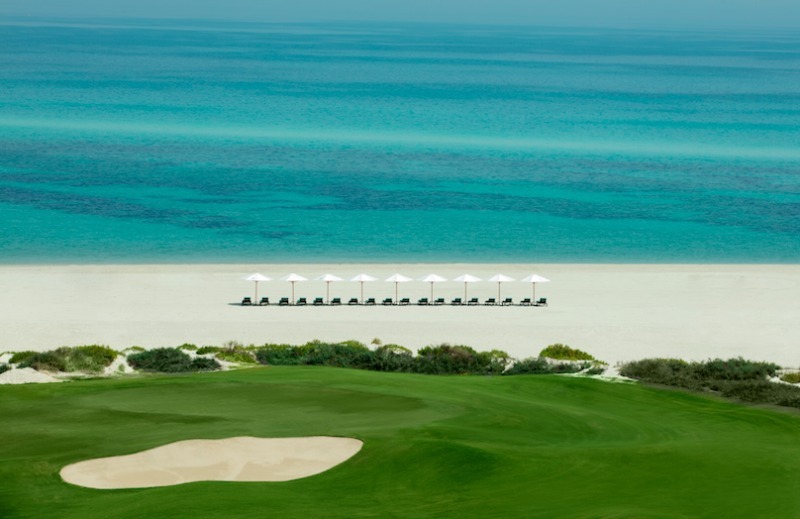 St Regis, Saadiyat Island was a warm and welcoming stay, easing us in gently to an exciting week ahead in the UAE with its southern European food and atmosphere. St. Regis is a family friendly retreat offering clubs and lessons for children and adults alike, from swimming to tennis, and also offering a unique venue for weddings and for meeting prospective clients all in an idyllic setting. November 2017 so far has seen the opening of the Louvre Abu Dhabi, just a ten minute drive away for those craving fine art and high culture, and while in Abu Dhabi, you must be sure to visit the Grand Sheikh zayed Mosque which is vast white perfection intertwined with gem stones in the stunning interior design.